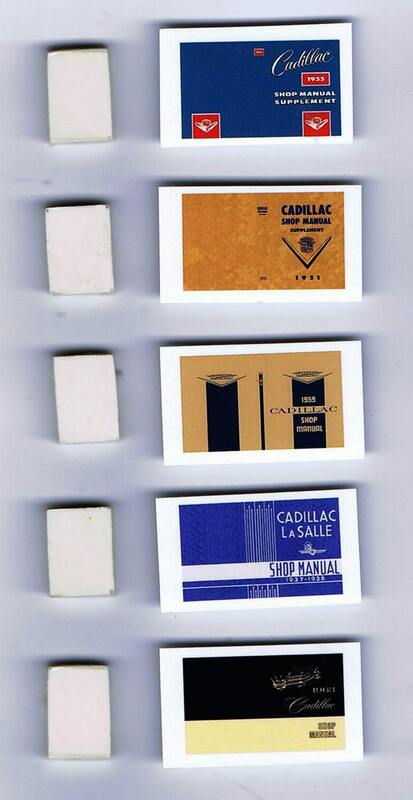 This is a set of shop service manuals for 1/24 and 1/25 scale model Cadillacs. These manuals replicate in scale the covers of service manuals for Cadillacs of various years. These are suitable for use on any car model, railroad layout, or diorama in a comperable scale. The covers are printed on photo paper using photo dyes for durability. This set includes five covers and five resin book bodies to wrap the covers around. Each book body has scored edges to simulate pages. Just cut out the covers, fold them iaround the resin book bodies, and glue these manuals in your model for added realism. These are scale model shop manuals for scale model cars. They are not real manuals for actual automobiles.